Under the railway, Prescott Street, Wigan. Been backwards and forwards under this tunnel to school and back numerous times. Went to All Saints and lived in Miry Lane. i think a woman was murdered under this bridge 1945 ish if i remember right by an american soldier . This recalls a memory of what happened to me about 80 years ago when I lived in Diggle St. and went to Blue Coat Junior School in Hallgate. 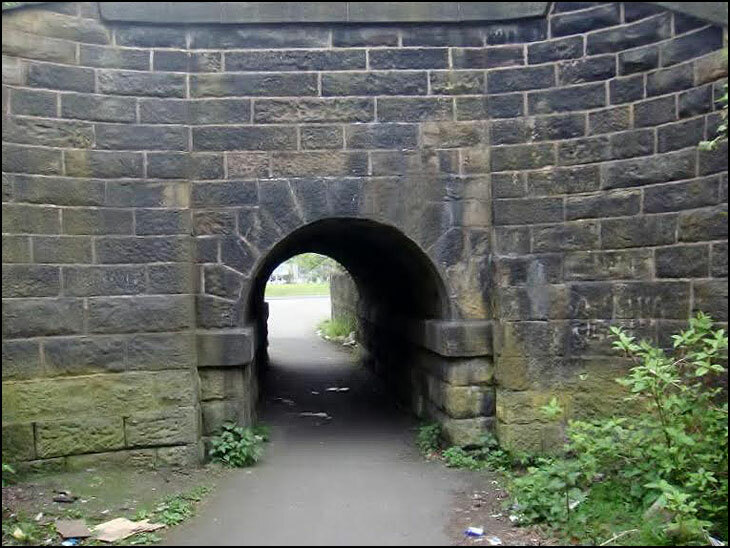 I went to the May fair on the Market Square with some school pals and afterwards went thro` this tunnel with them - I don`t remember why. I couldn`t find this tunnel on going back home but eventually I did! When me and my mates where about 16 years old we went to Wigan on the bus and found our selves down wallgate on a rainy misty night and then in a pub called the Buck i'th Vine. We thought we where at the end of the world it was so gloomy. Like Catherine..been under it scores of times,I lived in Gt George St..my Auntie lived in Prescot St..I didn't know about the murder though. There was a murder in that area and the perpetrator named Green was hanged for it.At the time the reporter called the area "A warren of dark streets"
he was only 11 years old. Hello Maureen..I remember a Maureen Murphy but thought she came from either Melbourne or Victoria St..if it is you and went to St Joseph's, I have a class photo of you..have you seen our School photo's on Album..and nice to talk to you as well.